The domain within your query sequence starts at position 67 and ends at position 121; the E-value for the L27 domain shown below is 2.46e-13. 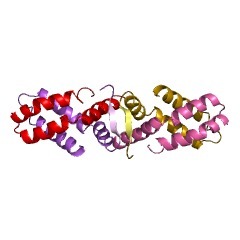 The L27 domain is a ~50-amino acid module, initially identified in the Lin-2 and Lin-7 proteins, that exists in a large family of animal scaffold proteins [(PUBMED:10871881)]. The L27 domain is a specific protein-protein interaction module capable of forming heteromeric complexes that can integrate multiple scaffold proteins into supramolecular assemblies required for establishment and maintenance of cell polarity. 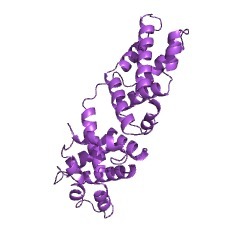 The L27 domain can be found as a single occurrence or as a duplication in association with other domains such as PDZ, SH3, the guanylate kinase domain or the serine/threonine protein kinase domain. 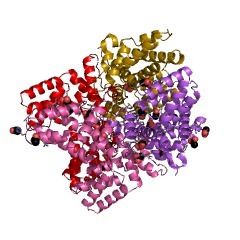 The main features of the L27 domain are conserved negatively charged residues and a conserved aromatic amino acid [(PUBMED:10871881)]. Study of individual L27 domains revealed largely unfolded domains that require the formation of obligate heterodimers to achieve well-folded structures. 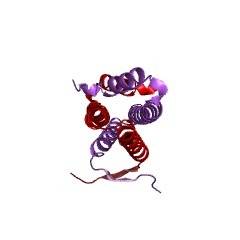 Each L27 domain is composed of three helices. The two L27 domains heterodimerize by building a compact structure consisting of a four-helix bundle formed by the first two helices of each L27 domain and one coiled-coil formed by the third helix of each domain [(PUBMED:15048107), (PUBMED:15241471)]. There are 11302 L27 domains in 7766 proteins in SMART's nrdb database. Taxonomic distribution of proteins containing L27 domain. This tree includes only several representative species. 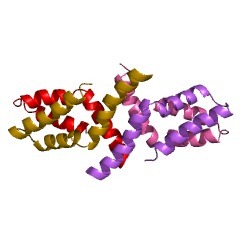 The complete taxonomic breakdown of all proteins with L27 domain is also avaliable. Click on the protein counts, or double click on taxonomic names to display all proteins containing L27 domain in the selected taxonomic class. Postsynaptic targeting of alternative postsynaptic density-95 isoforms by distinct mechanisms. Members of the postsynaptic density-95 (PSD95)/synapse-associated protein-90 (SAP90) family of scaffolding proteins contain a common set of modular protein interaction motifs including PDZ (postsynaptic density-95/Discs large/zona occludens-1), Src homology 3, and guanylate kinase domains, which regulate signaling and plasticity at excitatory synapses. 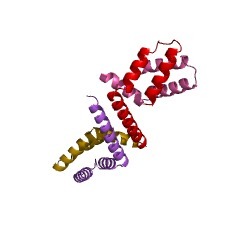 We report that N-terminal alternative splicing of PSD95 generates an isoform, PSD95beta that contains an additional "L27" motif, which is also present in SAP97. Using yeast two hybrid and coimmunoprecipitation assays, we demonstrate that this N-terminal L27 domain of PSD-95beta, binds to an L27 domain in the membrane-associated guanylate kinase calcium/calmodulin-dependent serine kinase, and to Hrs, an endosomal ATPase that regulates vesicular trafficking. By transfecting heterologous cells and hippocampal neurons, we find that interactions with the L27 domain regulate synaptic clustering of PSD95beta. Disrupting Hrs-regulated early endosomal sorting in hippocampal neurons selectively blocks synaptic clustering of PSD95beta but does not interfere with trafficking of the palmitoylated isoform, PSD95alpha. These studies identify molecular and functional heterogeneity in synaptic PSD95 complexes and reveal critical roles for L27 domain interactions and Hrs regulated vesicular trafficking in postsynaptic protein clustering. A novel and conserved protein-protein interaction domain of mammalian Lin-2/CASK binds and recruits SAP97 to the lateral surface of epithelia. Mammalian Lin-2 (mLin-2)/CASK is a membrane-associated guanylate kinase (MAGUK) and contains multidomain modules that mediate protein-protein interactions important for the establishment and maintenance of neuronal and epithelial cell polarization. The importance of mLin-2/CASK in mammalian development is demonstrated by the fact that mutations in mLin-2/CASK or SAP97, another MAGUK protein, lead to cleft palate in mice. 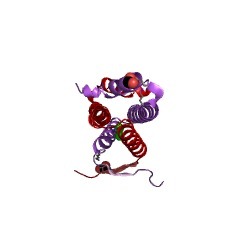 We recently identified a new protein-protein interaction domain, called the L27 domain, which is present twice in mLin-2/CASK. In this report, we further define the binding of the L27C domain of mLin-2/CASK to the L27 domain of mLin-7 and identify the binding partner for L27N of mLin-2/CASK. Biochemical analysis reveals that this L27N domain binds to the N terminus of SAP97, a region that was previously reported to be essential for the lateral membrane recruitment of SAP97 in epithelia. Our colocalization studies, using dominant-negative mLin-2/CASK, show that the association with mLin-2/CASK is crucial for lateral localization of SAP97 in MDCK cells. We also report the identification of a novel isoform of Discs Large, a Drosophila melanogaster orthologue of SAP97, which contains a region highly related to the SAP97 N terminus and which binds Camguk, a Drosophila orthologue of mLin-2/CASK. Our data identify evolutionarily conserved protein-protein interaction domains that link mLin-2/CASK to SAP97 and account for their common phenotype when mutated in mice. The Maguk protein, Pals1, functions as an adapter, linking mammalian homologues of Crumbs and Discs Lost. Membrane-associated guanylate kinase (Maguk) proteins are scaffold proteins that contain PSD-95-Discs Large-zona occludens-1 (PDZ), Src homology 3, and guanylate kinase domains. 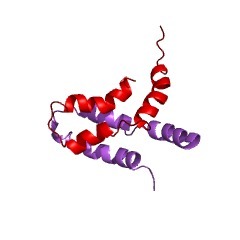 A subset of Maguk proteins, such as mLin-2 and protein associated with Lin-7 (Pals)1, also contain two L27 domains: an L27C domain that binds mLin-7 and an L27N domain of unknown function. Here, we demonstrate that the L27N domain targets Pals1 to tight junctions by binding to a PDZ domain protein, Pals1-associated tight junction (PATJ) protein, via a unique Maguk recruitment domain. PATJ is a homologue of Drosophila Discs Lost, a protein that is crucial for epithelial polarity and that exists in a complex with the apical polarity determinant, Crumbs. PATJ and a human Crumbs homologue, CRB1, colocalize with Pals1 to tight junctions, and CRB1 interacts with PATJ albeit indirectly via binding the Pals1 PDZ domain. In agreement, we find that a Drosophila homologue of Pals1 participates in identical interactions with Drosophila Crumbs and Discs Lost. This Drosophila Pals1 homologue has been demonstrated recently to represent Stardust, a crucial polarity gene in Drosophila. Thus, our data identifies a new multiprotein complex that appears to be evolutionarily conserved and likely plays an important role in protein targeting and cell polarity. The molecular mechanisms underlying the organization of ion channels and signaling molecules at the synaptic junction are largely unknown. 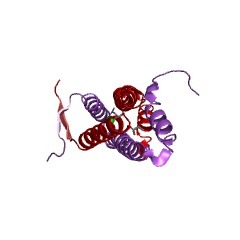 Recently, members of the PSD-95/SAP90 family of synaptic MAGUK (membrane-associated guanylate kinase) proteins have been shown to interact, via their NH2-terminal PDZ domains, with certain ion channels (NMDA receptors and K+ channels), thereby promoting the clustering of these proteins. Although the function of the NH2-terminal PDZ domains is relatively well characterized, the function of the Src homology 3 (SH3) domain and the guanylate kinase-like (GK) domain in the COOH-terminal half of PSD-95 has remained obscure. We now report the isolation of a novel synaptic protein, termed GKAP for guanylate kinase-associated protein, that binds directly to the GK domain of the four known members of the mammalian PSD-95 family. 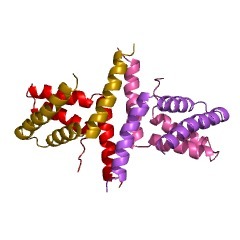 GKAP shows a unique domain structure and appears to be a major constituent of the postsynaptic density. GKAP colocalizes and coimmunoprecipitates with PSD-95 in vivo, and coclusters with PSD-95 and K+ channels/NMDA receptors in heterologous cells. Given their apparent lack of guanylate kinase enzymatic activity, the fact that the GK domain can act as a site for protein-protein interaction has implications for the function of diverse GK-containing proteins (such as p55, ZO-1, and LIN-2/CASK). This information is based on mapping of SMART genomic protein database to KEGG orthologous groups. Percentage points are related to the number of proteins with L27 domain which could be assigned to a KEGG orthologous group, and not all proteins containing L27 domain. Please note that proteins can be included in multiple pathways, ie. the numbers above will not always add up to 100%.